Sarnia International Powerboat Festival is an all-ages three (3) day outdoor festival taking place August 8-10, 2014. The festival is the largest in Sarnia with over 35,000 people. 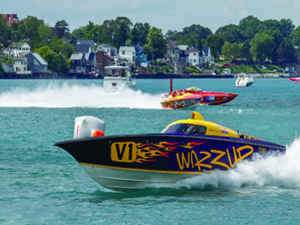 The festival's main attraction is the free professional powerboat race on the St. Clair River, Sunday afternoon. It also features two ticketed concerts that include new and established Canadian & American music artists on the Friday and Saturday night. There is plenty of daytime programming geared to the whole family which includes boat parades, powerboat time trials, boat displays, wakeboard competitions, meet and greet with drivers, inflatable childrens' play area, local bands, street performers, local business', artist kiosks and an interactive tall ships.